The Center for Professional Innovation & Education (CfPIE), the global leader in providing training for pharmaceutical, medical device, and cosmetic industry personnel, is expanding its reach into the El Paso, Texas, market with new medical device courses beginning this fall. CfPIE, in partnership with the Medical Center of the Americas Foundation (MCA) and BIO El Paso - Juarez, is bringing medical device training opportunities to El Paso, TX, in order to serve the rapidly growing medical device community of manufacturing and research/development professionals in the El Paso/Juarez area. The medical device training courses to be held at the MCA office will be delivered by CfPIE’s roster of industry-leading subject matter experts. These training courses are designed to advance the knowledge and careers of working professionals by providing the latest regulatory information and strategies for successful development and manufacture of cutting edge medical devices. CfPIE certification pathways offer many benefits to organizations and individuals. They assist in maintaining the organization’s edge by keeping personnel current with industry trends, regulatory changes, and compliance updates, as well as expanding professional advancement opportunities for team members driving motivation, enthusiasm, collaboration, and knowledge. To learn more about upcoming El Paso medical device training courses, or to register for these courses, connect with CfPIE online. 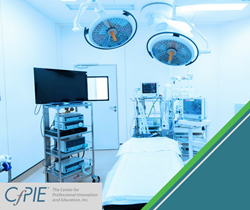 About CfPIE: The Center for Professional Innovation & Education (CfPIE) is the global leader in providing training for pharmaceutical, medical device, and cosmetic industry personnel. CfPIE offers hundreds of courses and certification programs each year via classroom or on-site locations. All coursework is taught by leading industry professionals, bringing real-life concepts and experience to theoretical applications. About MCA: The Medical Center of the Americas (MCA) Foundation, a 501(c)(3) non-profit organization, and its affiliated companies are focused on creating a world-class medical center within the MCA Campus in south central El Paso, Texas, along with a regional biomedical industry that will foster and accelerate innovation, create new employment opportunities, and meet healthcare needs for the Paso del Norte region. About BIO El Paso - Juárez: BIO El Paso - Juarez is a bi-national, membership-based organization whose purpose is to create a forum for members to accelerate the formation, expansion and attraction of biomedical enterprise in West Texas and Northern Chihuahua, Mexico, leading to enhanced industry performance and growth of biomedical employment. Their mission is to convene industry, government, non-profit, and education institutions with a passion to improve the region’s global competitiveness and quality of healthcare, and provide them with a platform for enhancing the El Paso-Juarez biomedical ecosystem and accelerating the formation, expansion/retention, and attraction of biomedical enterprise in the region.